Check out Ted Lilly above pitching in a rehab assignment for the Rancho Cucamonga Quakes yesterday afternoon. He threw two scoreless innings, allowing just one hit and a walk. Pic via twitter @MayorNHL. The Mayor (whose pic is above) follows up with a story about Lilly. “I think they want to win,” Lilly said of the Dodgers’ recent addition of infielder Hanley Ramirez and the notion that more help is likely on the way. Via Ken Gurnick at MLB.com, Luis Cruz brings consistency to Dodgers. "He's not Ozzie Smith at shortstop, but if he gets his glove on the ball, he catches it and throws them out," said manager Don Mattingly. 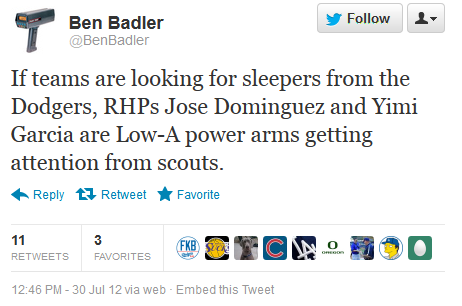 "He's stabilized the position and swung the bat well." Check out Left Field Pavilions great graphic celebrating the Dodgers first back-to-back shutout games against the Giants at their home since 1957. Former Brooklyn Dodger Ed Stevens passed away last week- RIP. Check out Nick Diunte's of Examiner.com story about his life and career. 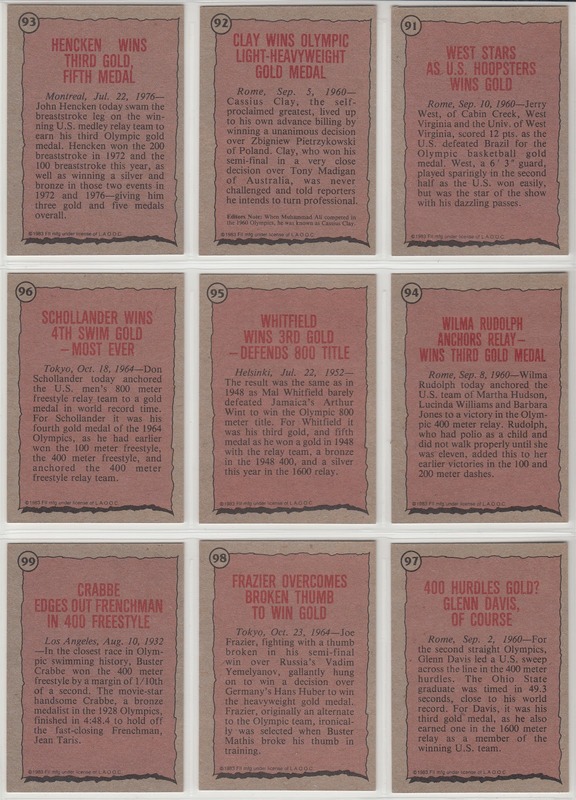 Check out a 1947 Tip Top Bread card of Stevens on the right. 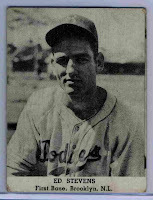 Leaving spring training in Havana in 1947, Leo Durocher had penciled him in as their opening day starter, beating out five other first baseman in the process. Left with little time to glow in the fruits of his hard work, Stevens’ jubilee would quickly turn sour as the day before the season opener, Dodgers general manager Branch Rickey announced that Jackie Robinson, not Stevens would be their opening day first baseman. Not only was Stevens about to witness Robinson break baseball’s color line, he also saw his position wither away right in front of his eyes. 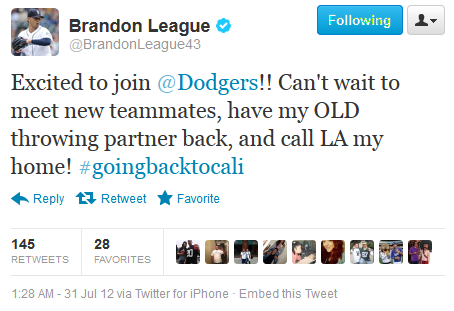 Via Steve Dilbeck of the LA Times, James Loney is heating up. With only two games left in July, he’s hit .328 this month with a .391 slugging percentage. He’s no doubt benefited some from being in a semi-platoon with Juan Rivera at first and he’s no one’s concept of an ideal first baseman, but he has been productive. And he is still excellent defensively. Steven at Zim's Autographs went to the Quakes game where Rubby De La Rosa and Ted Lilly pitched on rehab assignments and got a bunch of autographs; including Rubby and Ted. 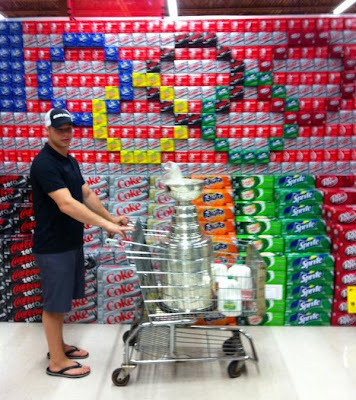 Even the Stanley Cup has Olympic fever. 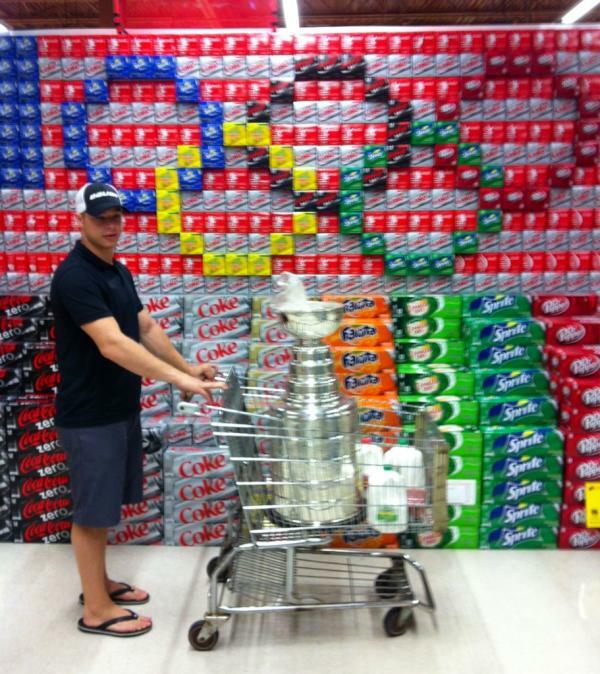 Pic via twitter @kepperofthecup shows Kings captain Dustin Brown doing some shopping. Then check out a great story about Brown's day with the cup, via Scott Burnside of ESPN. Are you a game used bat collector? Well, PSA just released a new online resource perfect for you. It it's called PSA Pro Bat Facts. 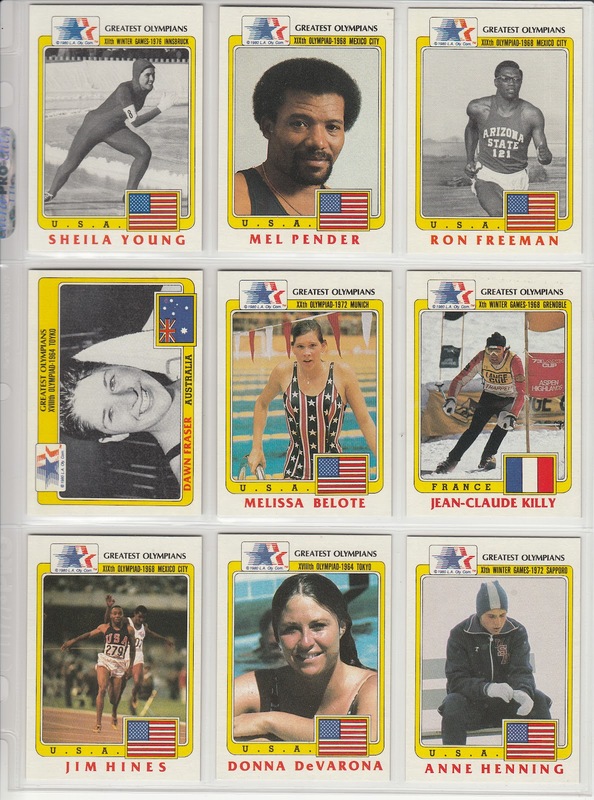 On top of that, PSA is planning to also release a similar resource for autographs soon I've added this website to my Hobby/Forum/Research Links page. Go there for other links of other hobby related links. Dodgers Sweep the Gints!!! Woo Hoo!!! I woke up this morning with a giant smile on my face. Heck, I got out of bed and did a little dance. To put you in a similar mood check out the Sweep Dance from a great unsung movie from the '80's, Breakin'. Legendary Auctions is running a small auction. There are only 63 items to look at, but don't mistake that for a lack of quality. 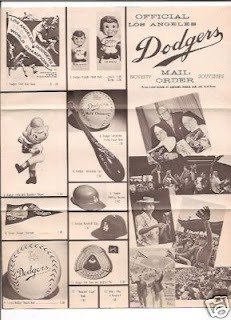 Following up on my post from Friday featuring a game-used cap once worn by Don Drysdale, here are several other memorabilia items I thought were worth noting. "1988 All-Star Game - Sporting News All Star Team - A.B 610 - Runs 120 - Hits 187 - H.R. 42 - Total Bases 347 - S.B. 40 - R.B.I. 124 - B.A. .307 - 1988 - A.P. Male Athlete of the Year - American League M.V.P. - A.P. All Star Team." Hilariously, Canseco didn't even show up to the awards banquet to receive this award. 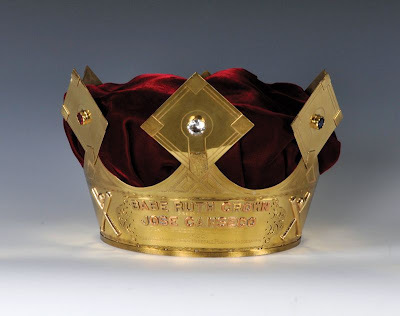 Canseco's failure to appear at the 1988 Tops in Sports Banquet—which he initially attributed to not having a tuxedo and later to his wife being ill—marked the first no-show in the Babe Ruth Crown's then-24-year history. Below is a 1897 bat attributed to Hall of Famer Cap Anson. Furthermore, this bat was displayed at "Nuf Ced" McGreevey's Third Base Saloon in Boston- considered the very first American sports bar. A place where heated debates were settled by the owner's stock phrase "Nuf Ced!" and where every wall was decorated to the nines (literally!) with museum-worthy baseball photos and memorabilia. Most famously, the dangling light fixtures were composed of glowing orbs mounted on the game-used bats of saloon patrons such as Cy Young, Nap Lajoie, Hugh Duffy, King Kelly and, finally, the venerable 45-year-old retiree Anson. On game days the Royal Rooters marched in procession from the 3rd Base Saloon to the Huntington Avenue Grounds, which was the team’s home field before Fenway Park opened in 1912. 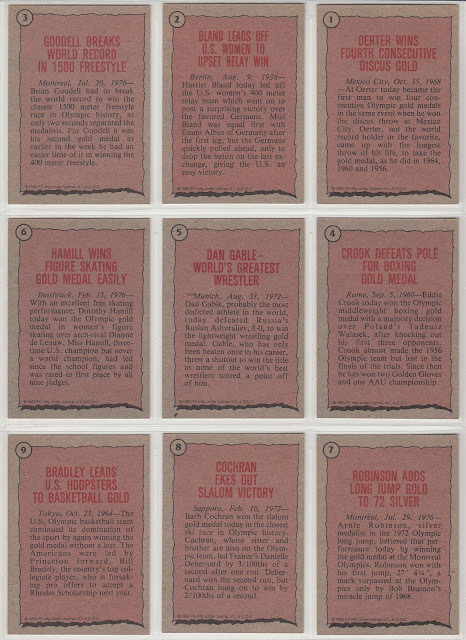 The Rooters had a reserved section of seats along the third base line, close enough to the field to intimidate or distract opposing players with their insults and vicious taunts. The below bat is the "pattern bat" that marks the very first professional player endorsement. That's right, this bat started it all. On September 1, 1905, Wagner famously signed a contract with esteemed bat-maker Hillerich & Bradsby that allowed his autograph to be branded on their Louisville Sluggers. It was the Big Bang moment, the genesis, of all sports endorsement deals to come—from the early crop of Cobb, Ruth, DiMaggio and Mantle, to the bling generation of Jordan, Woods, Armstrong, Beckham and LeBron. 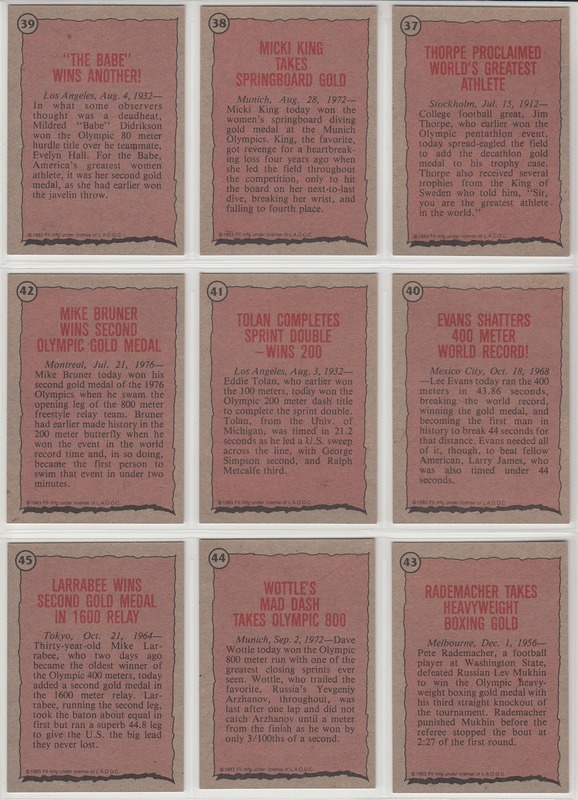 Honus Wagner was one of the most recognizable athletes of the time and he was the first player paid for his endorsement. 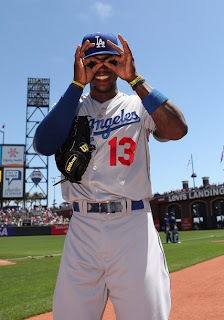 As I'm sure you've noticed, when Hanley Ramirez joined the Dodger he brought along with him a goofy hand gesture that has been quickly adopted by the Dodgers. 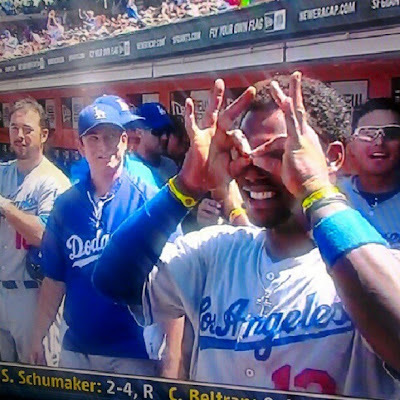 He forms something I can only call "hand-binoculars" after every successful at-bat and looks towards the Dodgers bench. For an explanation of this whole spectacle listen to Vin Scully explain it all. Here's what the August edition of Dodgers Magazine look like. Click on any pic to embiggen. 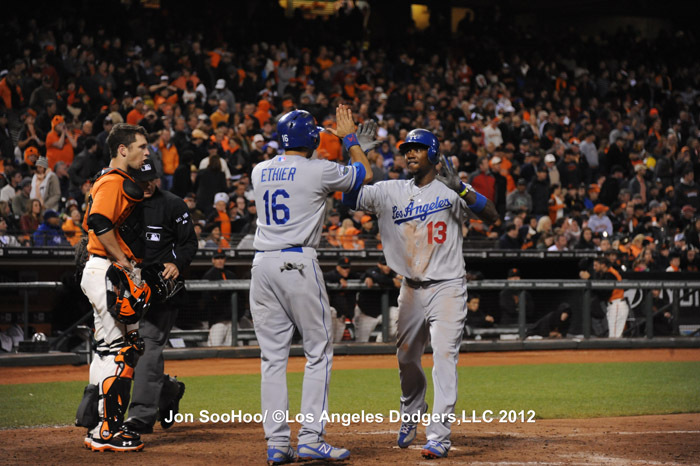 Via Ken Gurnick at MLB.com, Manny Mota Providing Support for Hanley With Dodgers. A big reason for Hanley Ramirez's smooth transition to his new club is the presence of Dodgers coach Manny Mota, whom, Ramirez said, he's known since he was "a little boy." 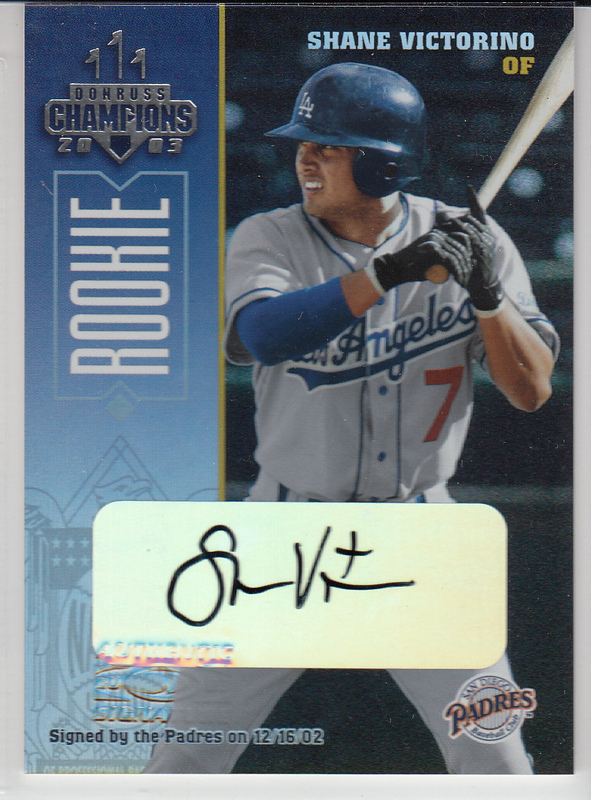 "I told him that what happened in the past is the past, this is a new beginning, and all he has to do is play baseball," Mota said. "He's a complete player. And he doesn't have to carry this team. There is Andre Ethier and Matt Kemp and now three guys together. 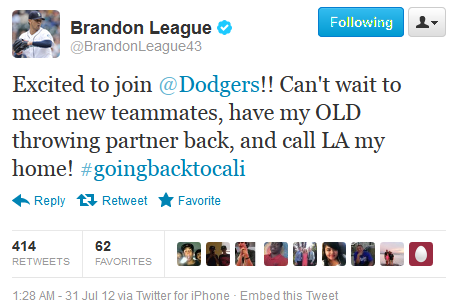 "He told me he's proud to be a Dodger, he knows the organization's history with Latin players and he's going to play hard. But I reminded him not to put pressure on himself. Maybe there was too much pressure on him in Miami. He doesn't have to carry this team. He has come to a good city with good fans and a rare organization. Now, just play hard and have fun." 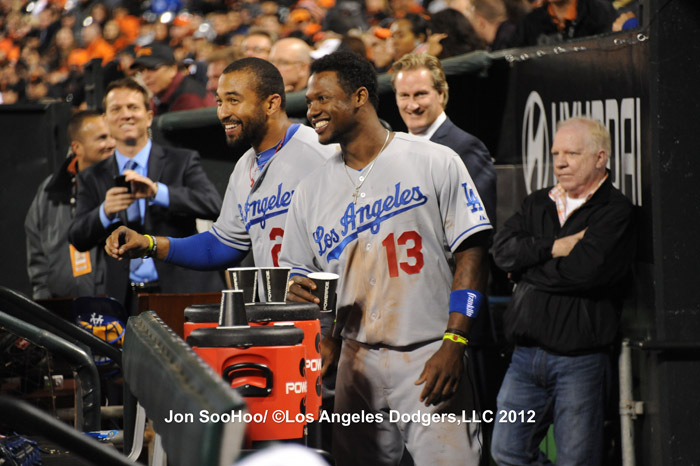 Listen to Dodgers President Stan Kasten on the State of the Dodgers, via the Dodgers Report at ESPN Radio. 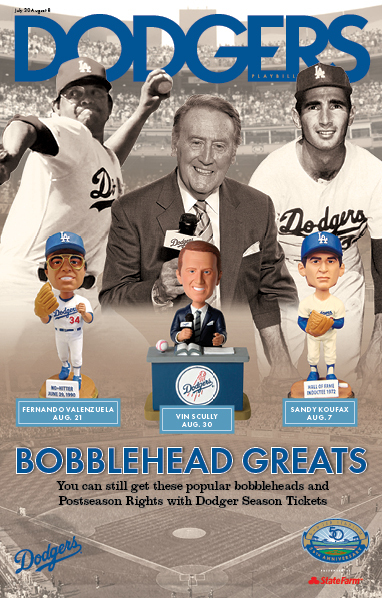 The eighth edition of the Dodgers Playbill features Dodger Hall of Fame broadcaster Vin Scully and Dodger greats Sandy Koufax and Fernando Valenzuela. 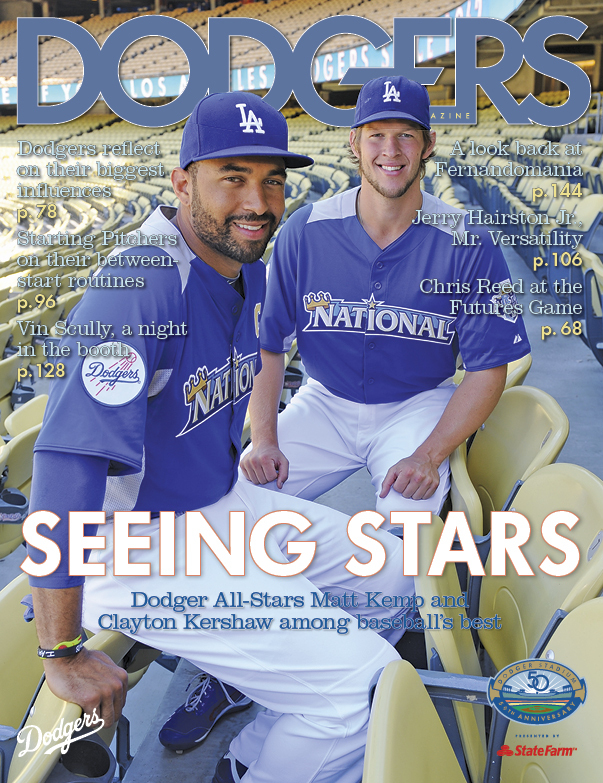 The playbill is distributed free to fans when they enter Dodger Stadium parking gates. See it at right. 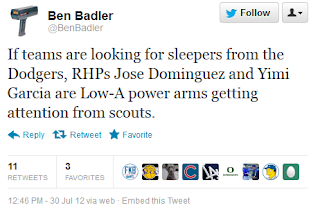 Minor League Ball reviews the Dodgers top 20 2012 pre-season prospects. 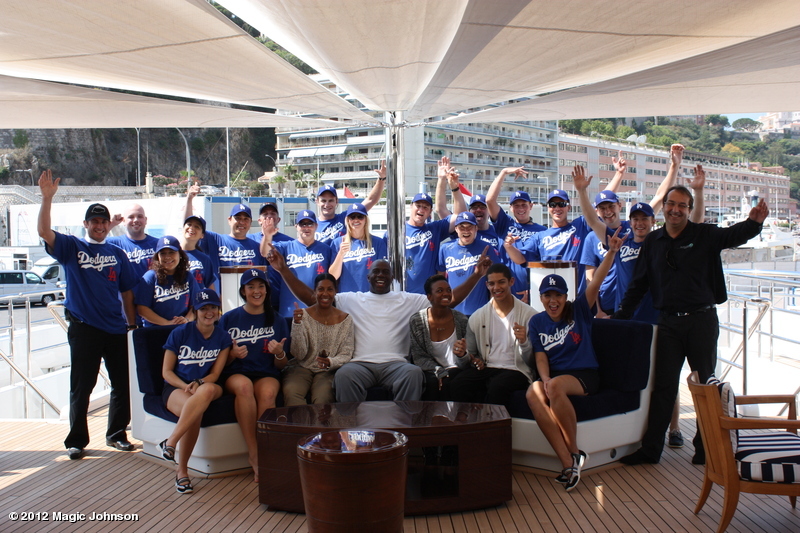 Mark Langill of Dodgers History recounts Lasorda's greatest story about the 2000 Olympics. Also from Ken Gurnick, along with Ted Lilly, Rubby De La Rosa will be making a rehab start in Rancho Cucamonga this afternoon. BTW, Jay Johnston is signing free autographs prior to the game today. 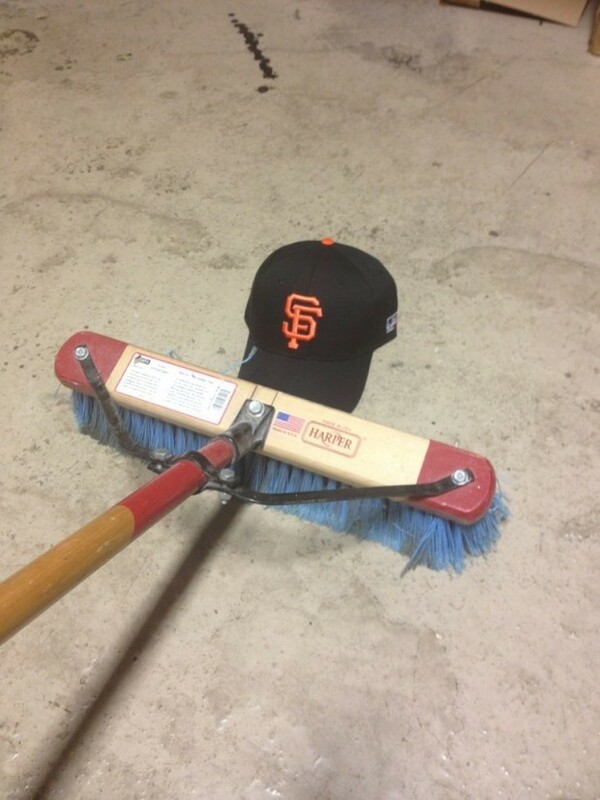 I see you, pic via twitter @DuranSports. Here are some incredible photos from the Open Ceremonies of the 2012 Summer Olympics in London, via Boston.com. Via Jill Painter at the Daily News we find out that the Stanley Cup Champion Los Angeles Kings are close to selling out for the upcoming season. "The season-ticket base would be so high where we wouldn't have an ability to sell any more. We have to take care of partial-plan holders, and we want to keep (tickets) for group ticket sales and individual buyers when we go on sale." 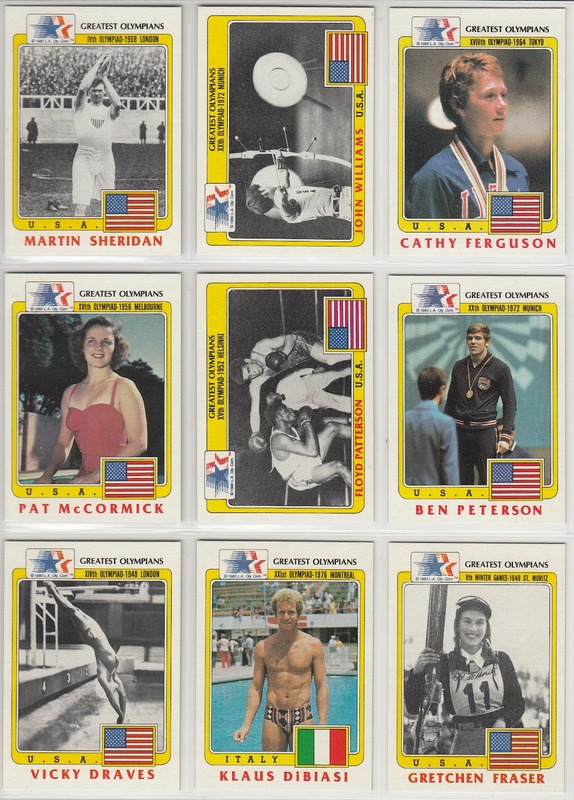 With the 2012 Summer Olympics underway, I figured I'd take a look an Olympic card set within my collection. 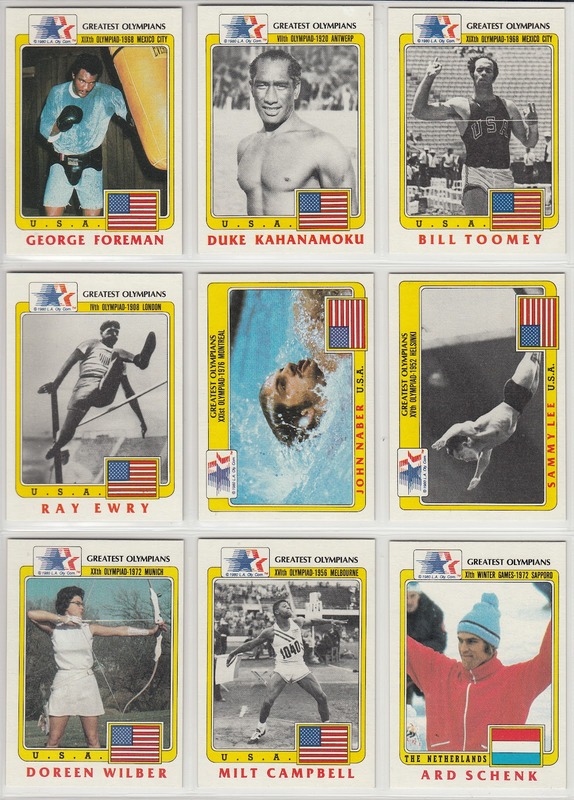 Check out the 1983 Topps Greatest Olympians set put out for the 1984 Summer Olympics in Los Angeles. 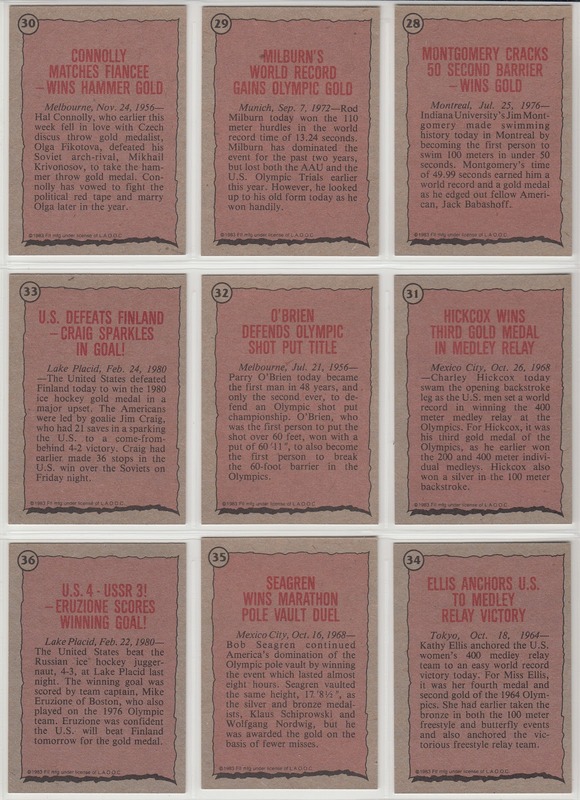 Here are scans of both the front and reverse of every card in the set; except the checklist. 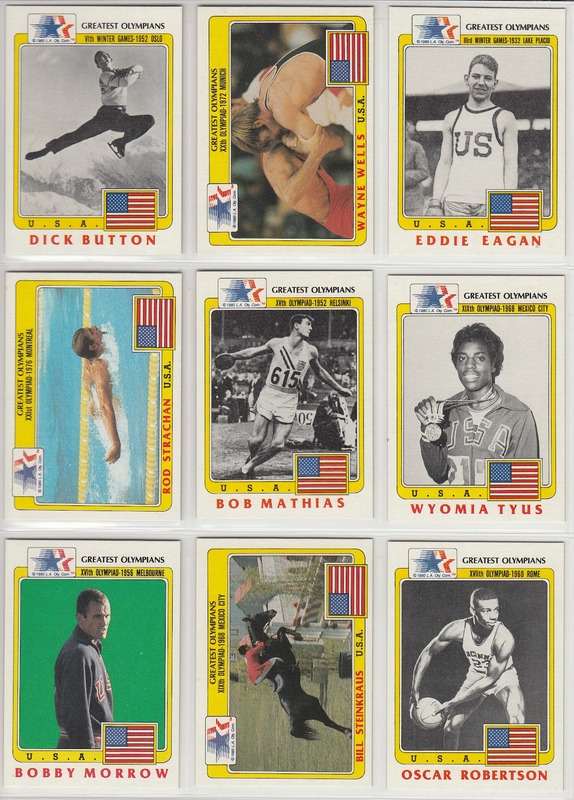 There are a total of 100 cards and it consist of mostly American medalist. Just about every star you've heard of is in it, as well as many who are probably totally foreign to you. 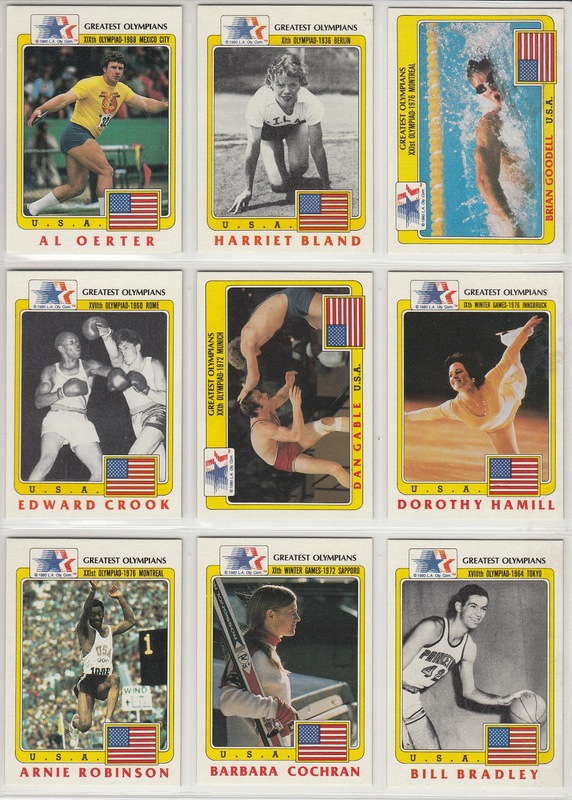 In the above photos are noted athletes Dorothy Hamill and NBA Hall of Famer Bill Bradley. As you can see, the reverse of the cards have a short biography of each person. 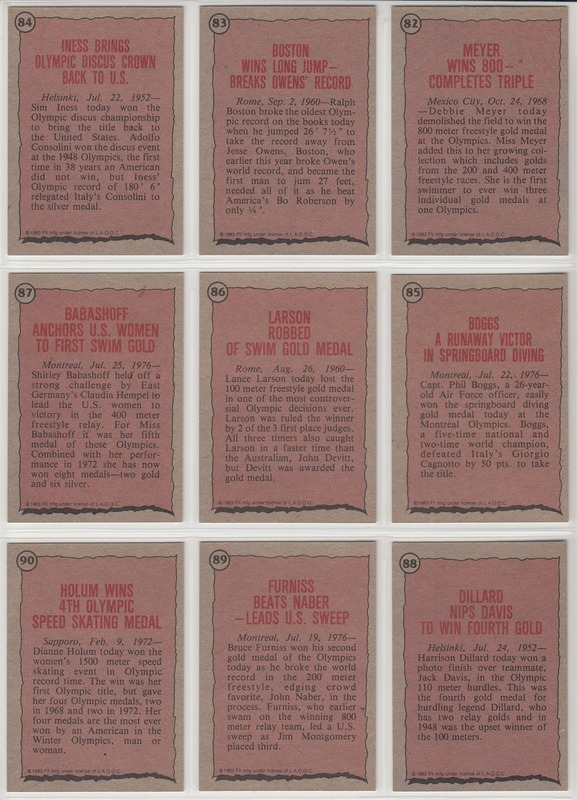 BTW, I don't think this set is particularly rare. 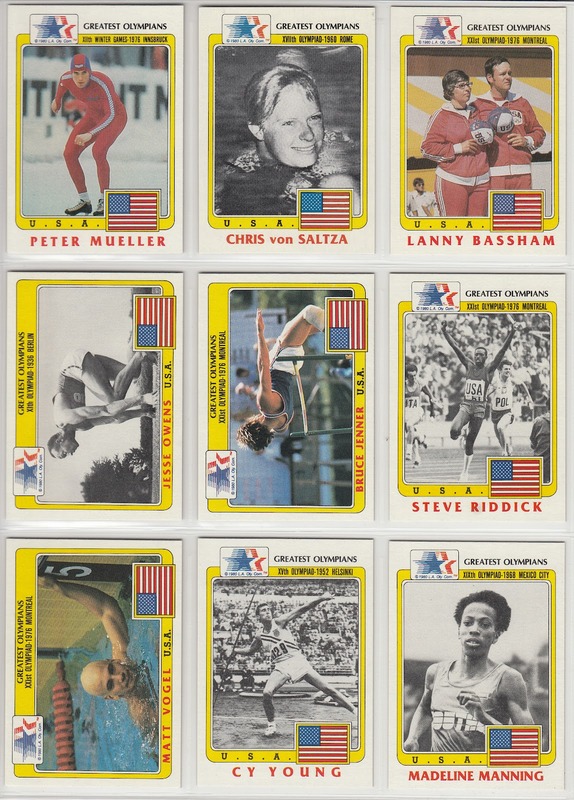 If memory serves me right, rack packs of the cards were available at local stores for well over a year after the '84 Olympics, so there is likely plenty of stock laying around somewhere. Check out the rest of the set below. Click on any pic to embiggen. The inventor of that magic grill, George Foreman, is below. 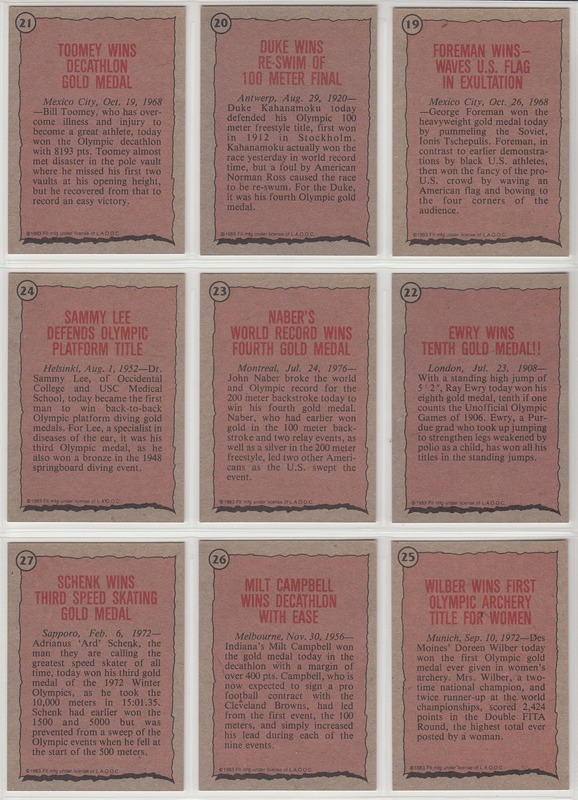 So is legendary surfer and five-time medalist in swimming, Duke Kahanamoku. Check out two members of the 1980 Winter Olympic Team USA hockey team- goalie Jim Craig and the "erupting volcano" Mike Eruzione. 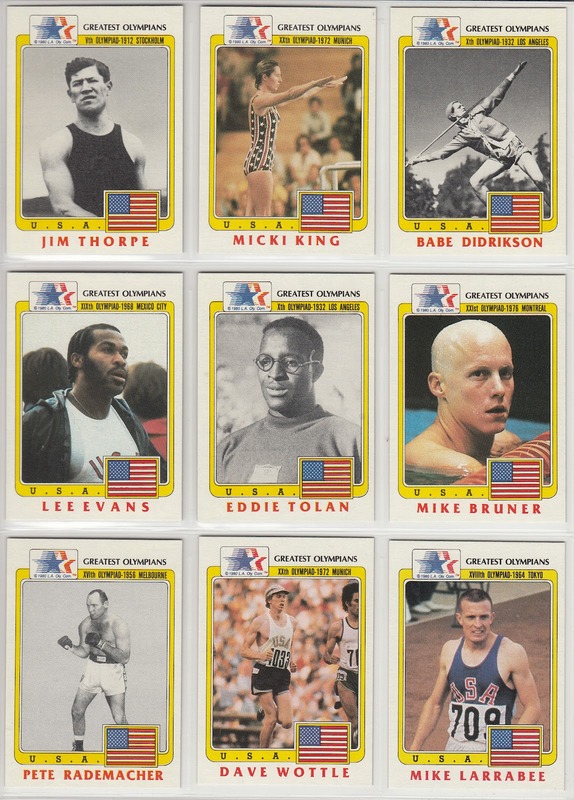 Jim Thorpe is probably one of America's greatest male athletes, while Babe Didrikson is considered one of America's greatest female athletes. See their card below. 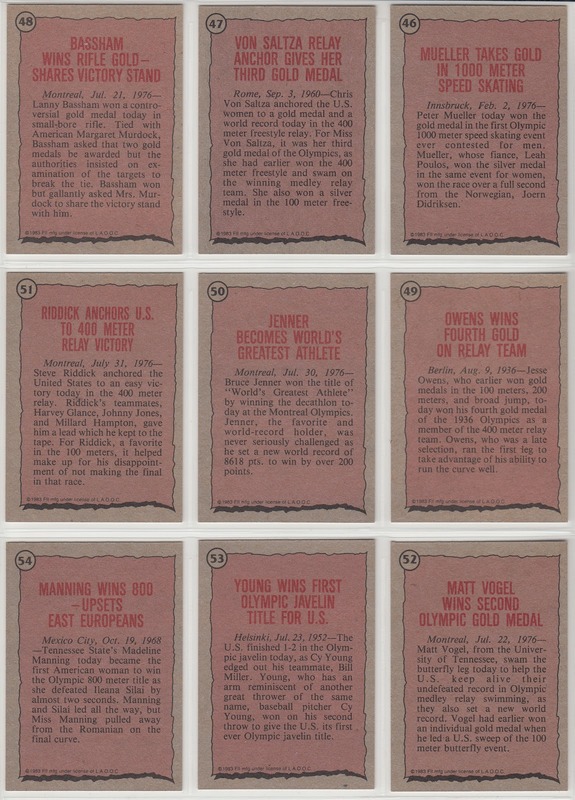 I had to make note of the Jesse Owens and Bruce Jenner cards below. 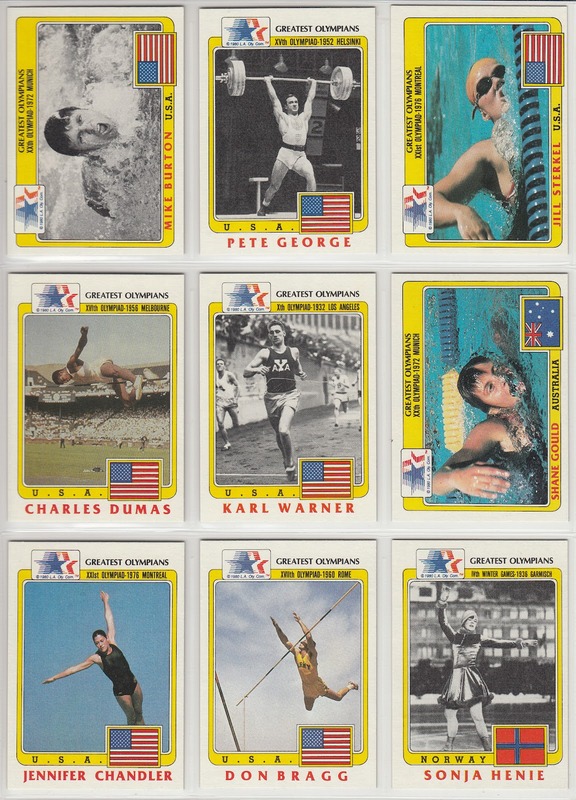 Also, did you know there was a champion American javelin thrower by the name of Cy Young? 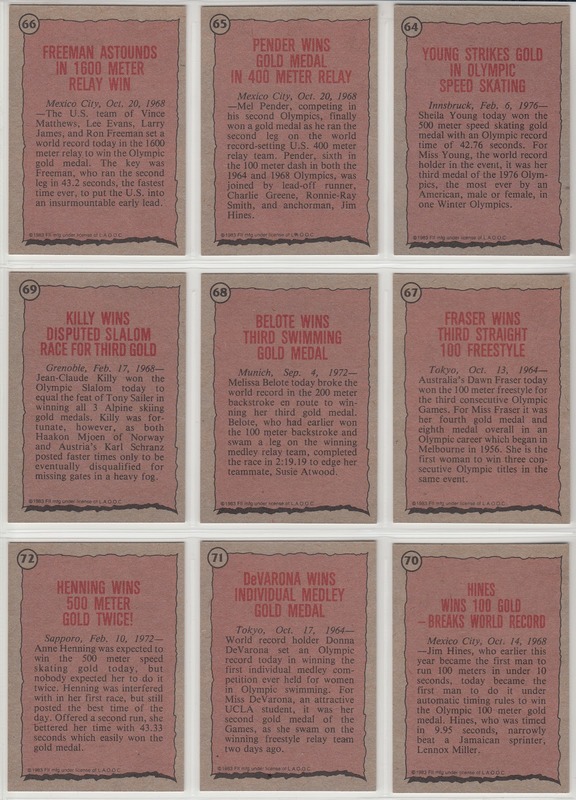 This is probably the best page in the whole set. 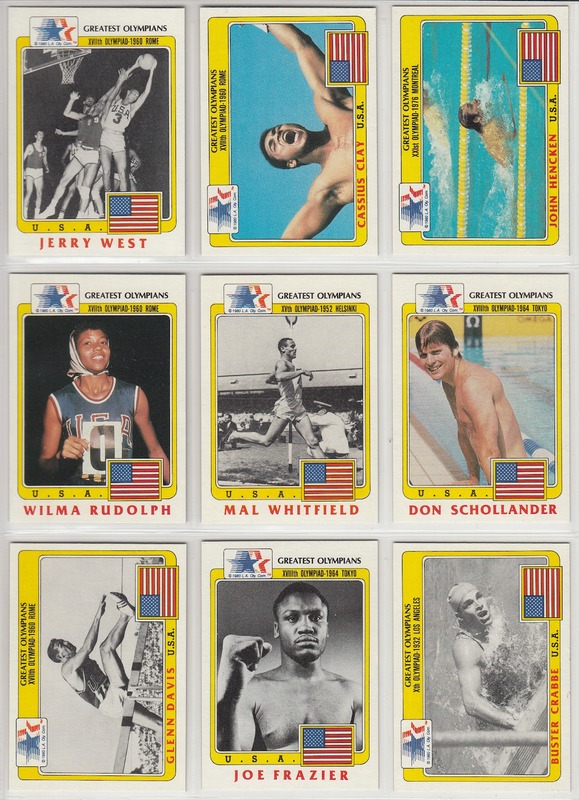 You can't go wrong with Ali, Jerry West, Wilma Rudolph, and Joe Frazier. 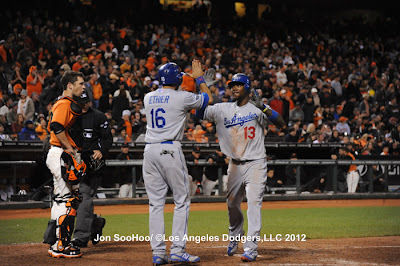 Here are todays Sunday Dodgers videos. During the Dodger open workout at Dodger Stadium Team President Stan Kasten spoke to the fans in attendance. It is long, but very worthwhile to watch. Stan has the passion, and I'm hoping it translates into wins. Here is a must see. Below is a 1964 recording of the Joey Bishop Show as several Dodgers come on stage to sing a tune. Don Drysdale leads the ensemble. Can you name the other players on stage? 96-year-old Mike Sandlock, the oldest living Brooklyn Dodger, discusses his thoughts on the Brooklyn fans in the 1940's. Meet 2012 Dodgers draftee Darnell Sweeney who recently was promoted to the Great Lakes Loons. Holy Moly! Wow! 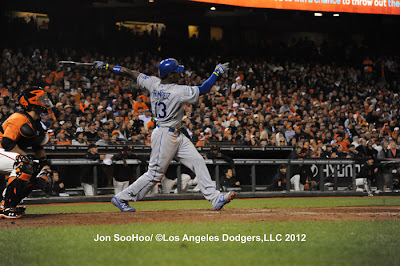 Hanley Ramirez sure has a flare for the dramatic. Not only does the trade that got him here define the new direction for the team, but it also shows that a little bit of "Dodger Blue" does a player good. After a subpar start to the season with Miami, Hanley goes ahead and shows that he has not lost a step. Hanleywood here we come! 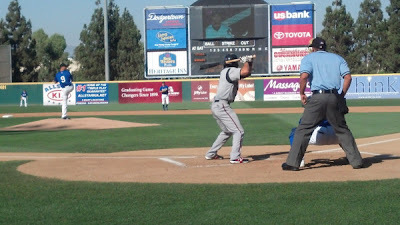 Below is a video of the home run, but I suspect youtube will be taken down soon. So, watch it before its gone. 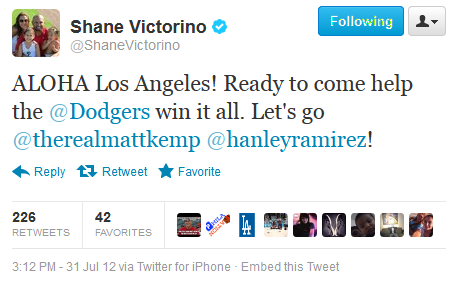 In the I'm not surprised department, after the game several Giants fans got in to it with some of the Dodgers. According to a post-game report by Steve Lyons, some Gints fans got in to a verbal confrontation with Dee Gordon (hat tip: Reddit). Considering that Dee lost his mother at a very young age I can only imagine what they said to him. Steve Lyons wrote this on his twitter account, @SteveLyons12. If you want a reason to hate the Giants this is the reason why. Goodwin & Co. recently concluded their most recent auction, so I thought I would feature a really old card they sold of a Brooklyn favorite. 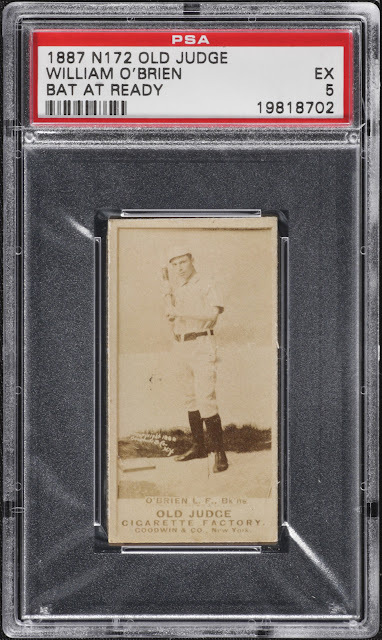 Check out the card below of old Brooklyn Bridegrooms/Grays William "Darby" O'Brien. 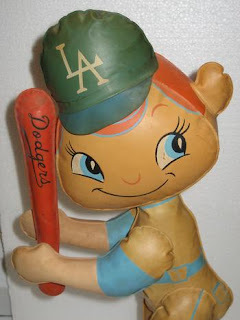 Born in Peoria, Illinois in 1863, Darby came of age just as Baseball was exploding in popularity. He was a right handed batter with a good bat, great speed, and a head for the game. Unfortunately, he would only have 6 years to show his stuff. Darby first joined the Brooklyn team after opening his rookie year with the New York Metropolitans in 1887 at the age of 23. Later in the year as the Metrolpolitans were closing shop, he was packaged along with 7 other teammates to Brooklyn for a then princely sum of approximately $25,000.00, and signed on for the next season for a reported annual salary of $1,900.00. The outfielder was described by The New York Times as an "honest, competent, hard-working and game ballplayer." For a working class neighborhood these traits quickly endeared him to the fans. He would bat .280 in his first season, while knocking in 65 runs and stealing 55 bases. 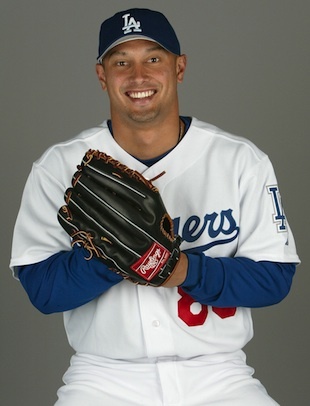 The next year he would bat .300, and hit a career high 5 home runs (this was quite a lot back then). Over his first 5 season with Brooklyn he would have a batting average of .278 with 648 hits, 321 RBI's and 272 steals (he currently ranks 137th on the Majors all-time steals list with 321). Then, lung problems he developed in his career caused him to enter the 1893 season in less than healthy shape. The team captain could no longer play, so he was sent to Colorado to allow his lungs to recover. Soon, the team and the community got behind him by putting together a benefit game in his honor in hopes of helping him pay for his treatment and his future. 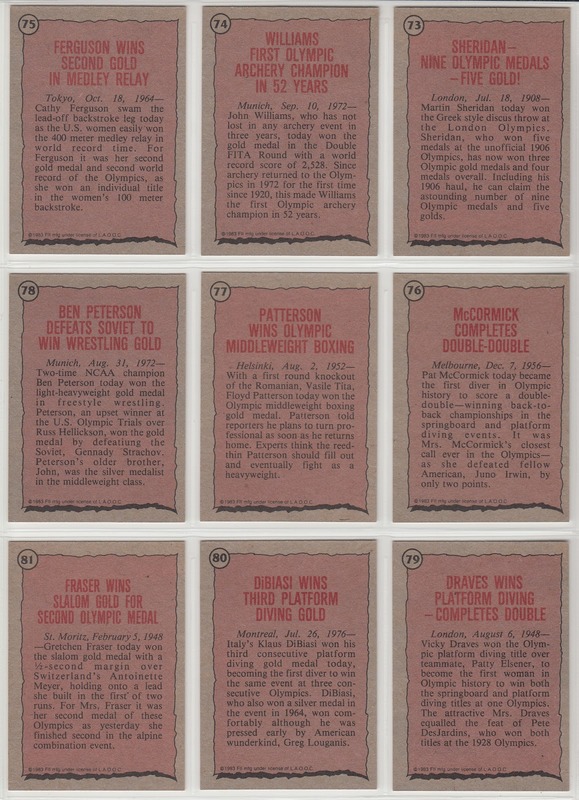 A news report from that time period indicates that 9,000 people showed up and $5,000.00 was raised. 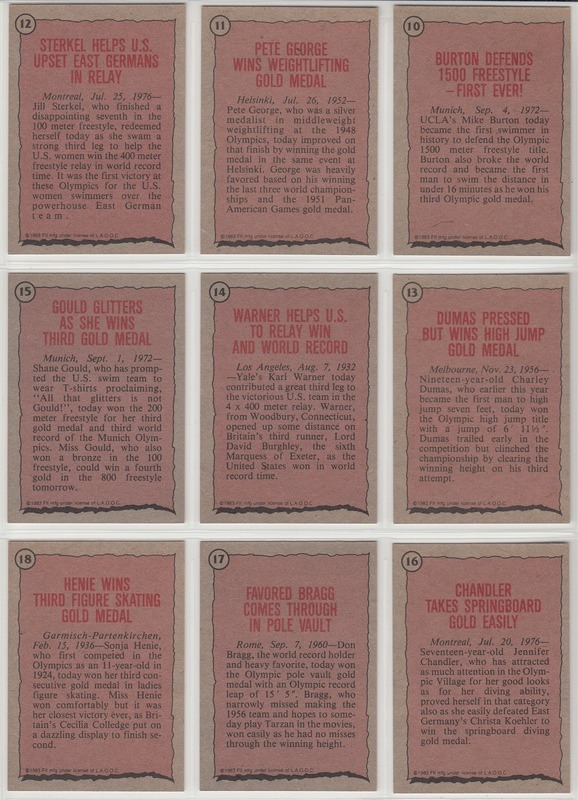 Every dollar earned from ticket and scorecard sales went directly to him. 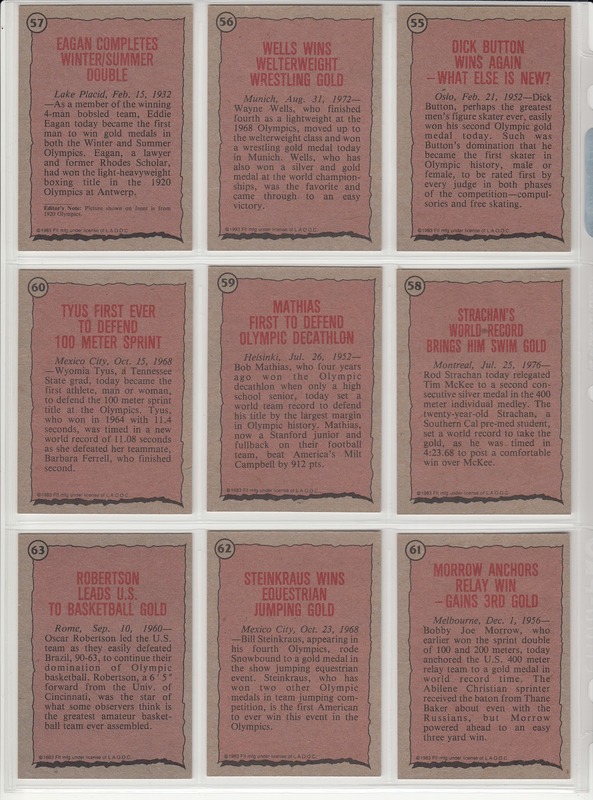 Heck, it was reported that numerous tickets were sold that were never used. Unfortunately, his change of scenery did not help Darby. Later that year in 1893 he would die of typhoid fever. Below is a 1887 N172 Old Judge card of O'Brien that recently sold for $346.29.